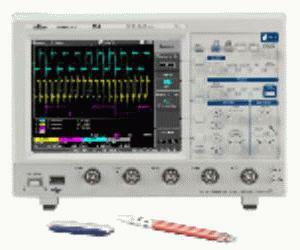 The WaveJet 300 Series features unmatched performance and debugging tools not usually found in low bandwidth portable oscilloscopes. Engineers can simplify and shorten their debugging process with the Replay feature and long capture time not available in other oscilloscopes with bandwidths at 100 MHz. On top of great performance and capabilities the WaveJet is lightweight and portable, it is only 4 inches deep and features a large 7.5 inch color display. Oscilloscope Settings and Reference Waveforms - Save captured waveforms and WaveJet settings to internal memory or a USB memory device. Recall those settings at a later time to compare your testing results.